ECO World Development Group Bhd (EcoWorld) has no overhang units despite the weak property market environment, says its president and chief executive officer Datuk Chang Khim Wah. National Property Information Centre reported that the number of unsold houses in Malaysia reached a record high of 30,115 units valued at RM19.54 billion in the third quarter of 2018. According to Chang, EcoWorld consistently sells between RM3 billion and RM4 billion worth of properties every year. “We always hear negative news about the property market, such as the increasing overhang units and affordable homes issue, but it is quite the opposite for EcoWorld Malaysia,” he said. Chang was speaking at the launch of HOPE (Home Ownership Programme), its most comprehensive and complete home ownership solution, to date. HOPE applies to EcoWorld Malaysia’s residential properties and will run for six months until June 30 next year. EcoWorld Malaysia expects HOPE to raise RM6 billion in sales for the financial years 2019 and 2020, and is optimistic about its prospects following the success of a similar campaign which ran from July to October last year. “We raked in RM2 billion worth of sales via the #OnlyEcoWorld campaign and we still see people coming to our sales gallery to know more about our residential units,” said Chang. HOPE offers two methods—stay2own (S2O) and help2own (H2O) for purchasers to start their home ownership journey. The S2O programme, which is a partnership with Malayan Banking Bhd (Maybank), will see the banking group purchasing Eco World’s properties and then leasing them to prospective home owners. The mechanism, an adaptation of Maybank’s existing HouzKEY product, will enable aspiring buyers or upgraders to own houses today and purchase later. The H2O offers flexible mortgage loan to make home ownership easier and more affordable. “If we are able to assist the young to own a good home earlier, it will also enable them to accumulate wealth sooner,” he said. According to Chang, many Eco World Malaysia employees, especially millennials and junior team members, had been keen to participate in the #OnlyEcoWorld campaign but they faced challenges. 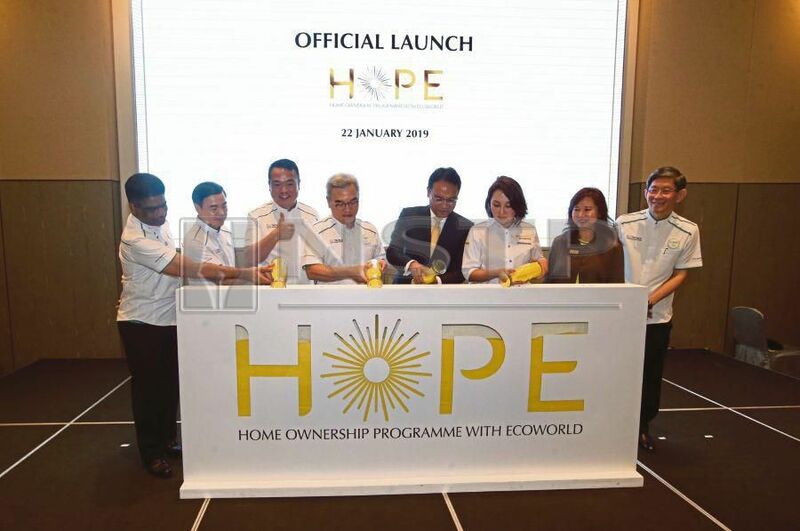 Chang believes HOPE will offer a great opportunity not only to first time house buyers but also upgraders looking to own a choice EcoWorld home.